Have you ever dreamed of owning a cat cafe? Many cat lovers find the idea irresistible but it’s not all cute kitties and cappuccino. As cat cafes keep popping up in record numbers, there is a downside. 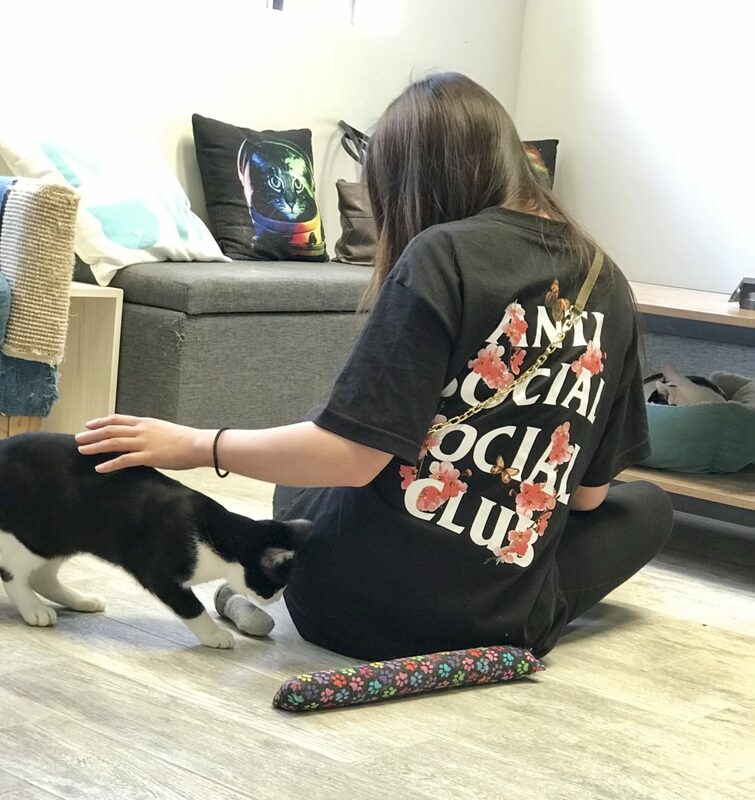 We update our extensive cat cafe directory monthly and for the first time, we are noticing closures due to lack of customers or poor business practices. 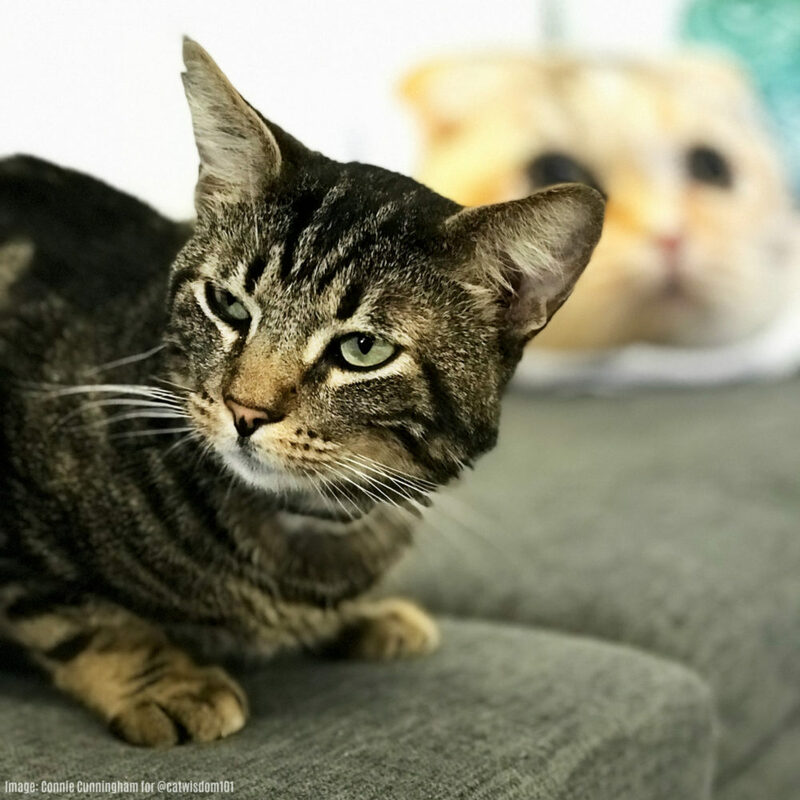 One cat cafe who is doing it right for all the right reasons is The Cat Cafe Lounge in Los Angeles. 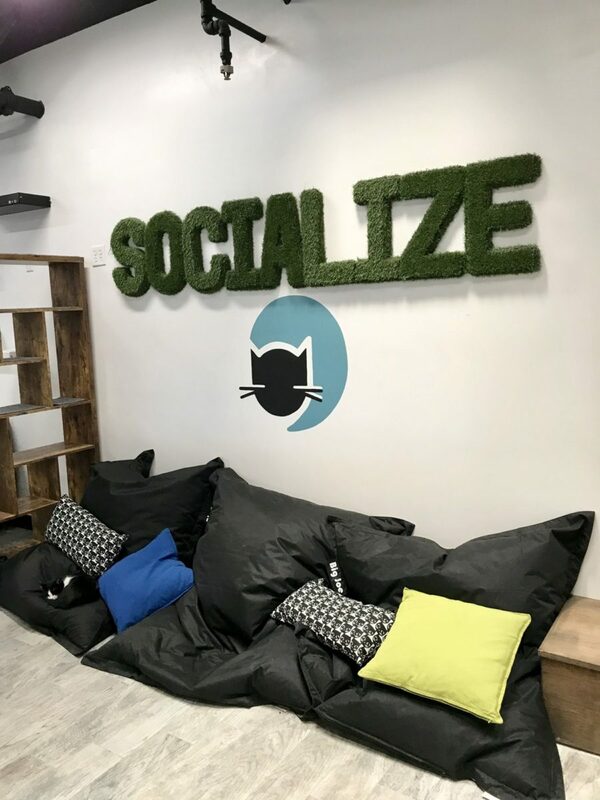 A few months ago I spoke with the owner Kristi Labrenz Galvan and she shared her long journey of finding the cat cafe’s heart and home, and why being a nonprofit was important. I couldn’t visit the cafe in person so I enlisted two local friends, Chase Holiday and Connie Cunningham to visit and this is their report. Connie Cunningham interviewed Kristi and supplied the exclusive pics and her honest opinion. Connie is better known on Instagram as @socalconnie and has one of the biggest hearts I know. She volunteers at Milos_sanctuary a special needs cat rescue and manages the social media for @sirthomastrueheart aka Tommy, their lion-hearted spokescat. He survived an acid attack, lost an eye but found his calling. He is even doing a meet and greet at CatCon this summer along with other rock star kitties like Lil Bub. Chase Holiday, created the video. 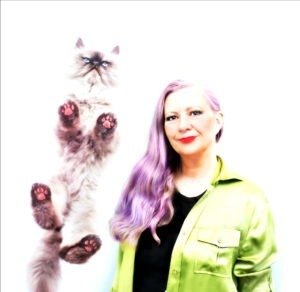 She is an all around creative known for her clever and funny cat videos Furball Fables and Crafty Kitty Cats. Her black cat Buddha is featured in our award-winning Black Cats Tell All book and Chase did our book trailer video. Both Connie and Chase are serious cat lovers and advocates. Do follow them on social. Enjoy the cat cafe right meow. Stairway to kitty paradise. Please note: the cafe is on the second floor and there is no elevator. 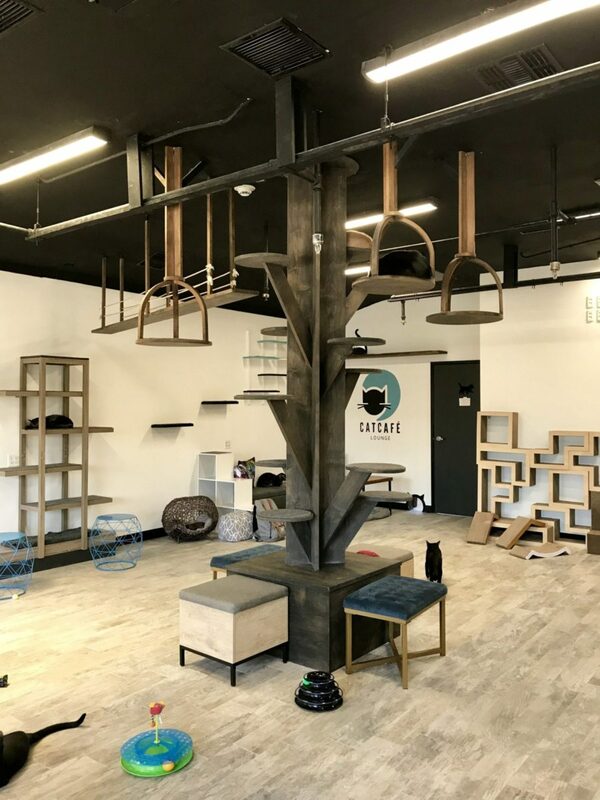 The CatCafé Lounge recently opened in Los Angeles California. It’s a 501 (c) 3 nonprofit with all entry fees are tax deductible. This was my first visit to cat café and I was excited to find out what the buzz was about. The cafe is located in West L.A. at 1736 S. Sepulveda Blvd. right off the 405 freeway and Santa Monica Blvd. Parking was no problem, which is a nice benefit in the Los Angeles area. The café is on the second floor with no elevator, so if you have any physical disabilities, call ahead and see if they can assist you. Entering the café you immediately see the cat area through a very large window. For health code reasons cats and food prep must be kept separate. In the lobby they offer assorted drinks and snacks and also their own branded t-shirts and cute cat jewelry that you can purchase. Next you enter a double door area to prevent cats from escaping and leads to the large airy cat lounge. It’s a nice large spacious area with many places for you to sit, relax and enjoy the cats. The whole area is amazing if you sit back and take it all in. There are catified shelves on the walls for the cats to sleep on perch or to use to travel throughout the room, there are also cat beds, toys and places to scratch throughout the area. My favorite is the enormous tree in the middle of the room with “branches” that lead to the walls. What a beautiful creative idea! Here’s another view. Every area is thoughtfully designed by Kristi’s sister-in-law who is an architect. 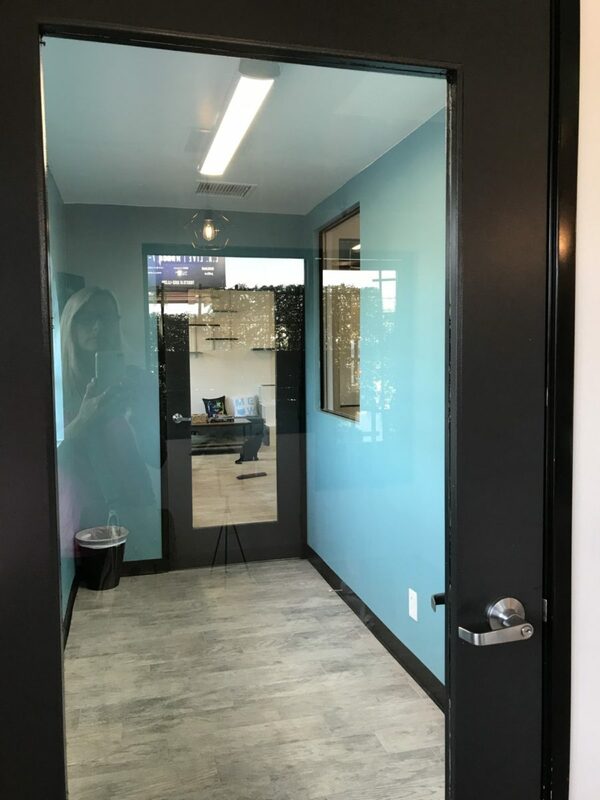 There are cat tunnels are strategically placed around the space that lead to a private area so that cats can get some alone time, if they feel the need. Cats rules the roost and can be found at every level. They prefer when you get down to their level. If you don’t want to sit on the spotless floor, you can sit on cushions or chairs. 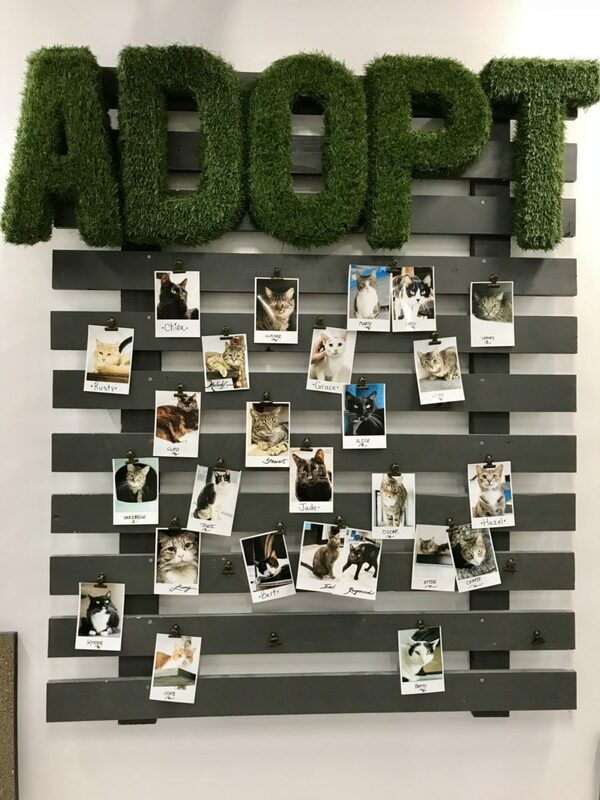 The CatCafé Lounge works with local rescues to help cat get adopted. 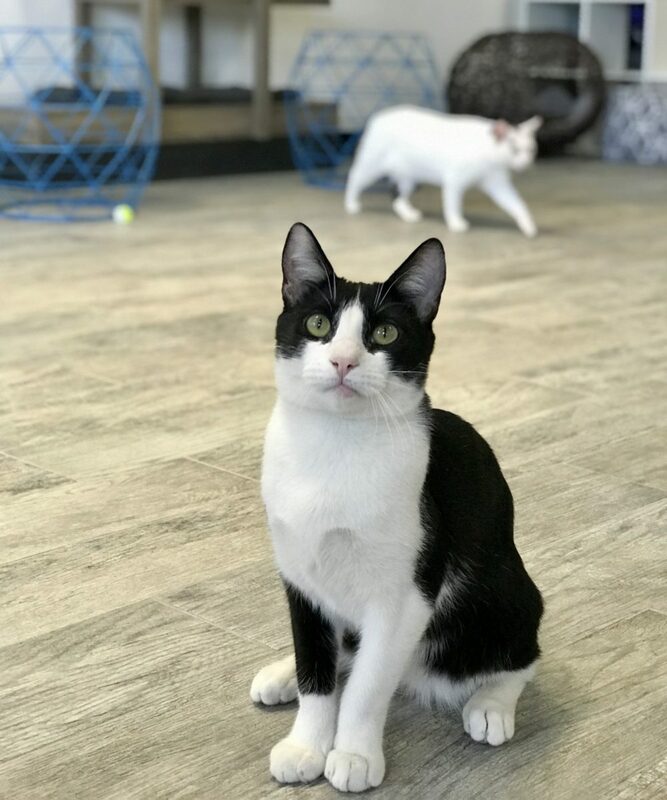 Kristi, the café owner, tells me that she will often request the shyest cats, who often get overlooked so they can get a chance to become socialized and have a better chance of finding their forever home. It’s all about the cats. And having fun until they find their forever homes. I was also shown the future outdoor catio area currently under construction. I can envision the potential of this space based on what they have accomplished inside, I’m sure the catio will be just as impressive. 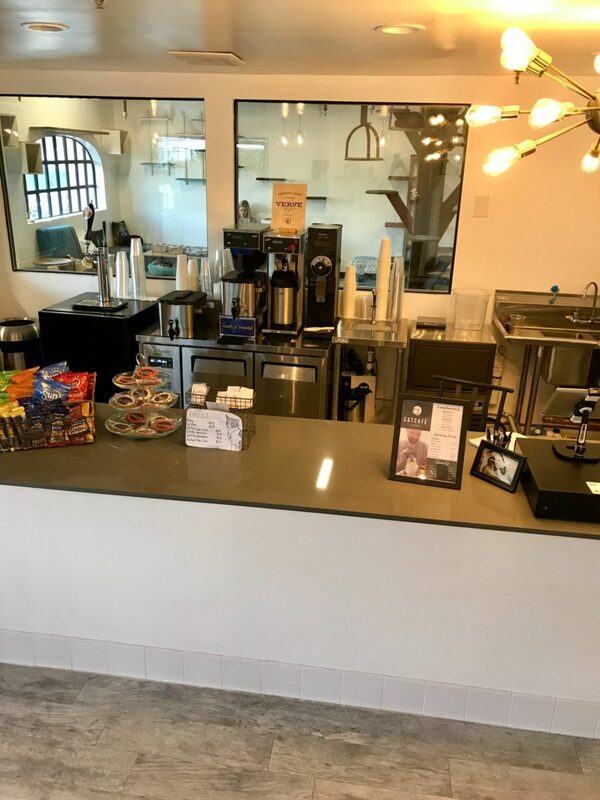 The café is a great place to study, but they also have special events like cat yoga, comedy night, movie night and you can even hold your own private event there! They offer student and group discounts. 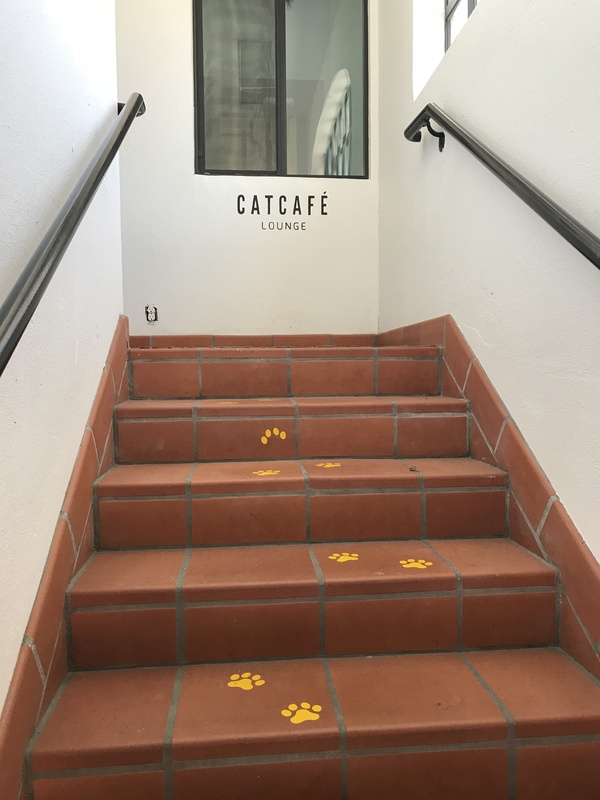 The CatCafe Lounge is a non-profit currently working with Stray Cat Alliance NKLA and SNPLA LA’s largest low cost spay/neuter and wellness provider. and meet the current residents of every and any stripe. Cute black kitties too! Sign up for their newsletter for upcoming events and follow them across all social media. We are proud to add CatCafe Lounge to our Cat Cafe Directory. Do you have a cat cafe near you? Please let us know if someone is planning to open a cat cafe in your town or neighborhood. Amazing and well thought out catification! Thanks for sharing this, Layla. There was a trial run of a pop up Cat Cafe in New Haven, CT. My husband Rick and I visited last year. http://www.shelter-cats.com/2017/12/mew-haven-cat-cafe/ They were fund raising and hoping to open on a more permanent basis. I think they’re still waiting for zoning permissions. Maggie, please keep me in the loop about the opening. BEAUTIFUL CAFE!!! We wish them the very best and like the fact that they are non profit. Like we all knew would be the case some of these cafes were solely for the owners profit and to be the “thing” of the moment and not for the best interest of the cats. These should not have opened to start with so we can only celebrate their closure. The ones that truly wanted to help cats we regret that they may not survive and thrive. We are totally pro cat and hope that they can rework ,survive and thrive. Luvs to all that luvs them kitties! Thanks, and I’d like to see more nonprofits too. More shelters are getting involved sometimes on site. Successful cafes require ongoing revenue and funding. That looks a great place for cats and people. Very unique awesome place. Never seen anything like it. Good work Kristi! Wow, I spent about an hour just looking at this, and dreaming of all the fun cats and humans have at this cat cafe. Thanks for enlightening us, Layla. Thanks, Kathryn. I’m curious if you’ve been to the cat cafe in Boston? That looks amazing. The cat tree in the middle is cool. That does look like a nice place and I’m so happy to hear that the shy ones are getting a chance too. 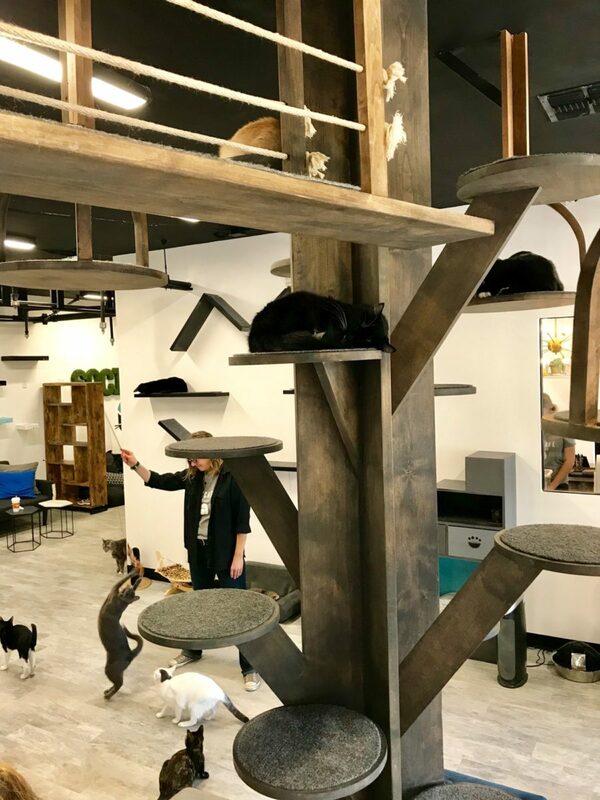 This cat cafe looks really cool! I wish they would open up a branch in northeast L.A. – it’s too far for my human to visit easily.